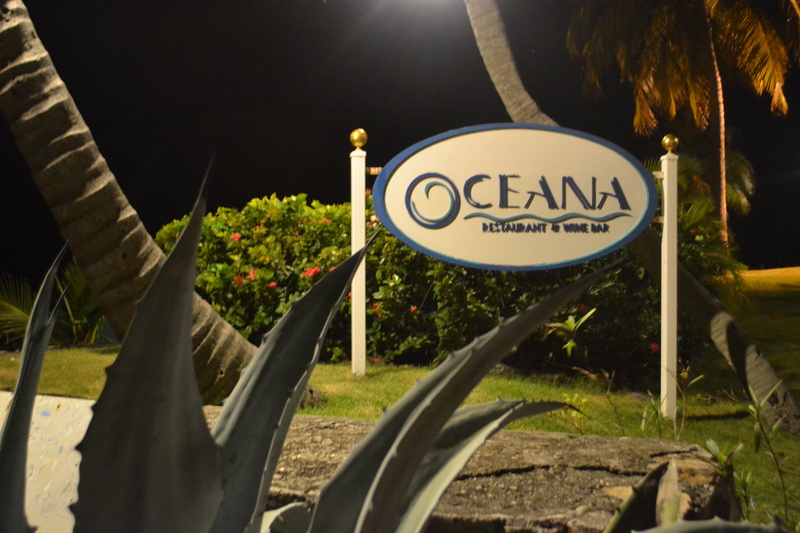 Our recent visit to Oceana was close to flawless from start to finish. This restaurant is an annual visit for our group and the visit to the beautiful setting was the culinary highlight of the extended weekend. Our servers for the evening were exceptional. They explained the evenings specials, at both ends of the long table, were helpful with suggestions, when one in our party explained her allergies, they were quick to check with the kitchen on each of the dishes, they delivered the food efficiently, checked in and were a part of our fun. We started the evening with a small gift from the chef. An Asian soup spoon was delivered to each of us. Each was filled with a gelee made with blueberry and kobuchi (Japanese tea). It was a very playful start to the meal and set the tone for the menu’s light options. For my appetizer I ordered the special of the evening, the Lobster Bisque. The bisque was served with a dollop of crème fraiche and a mini-triangle of grilled cheese. This version offered a delicate flavor from the lobster; it was not overwhelming; and was offset by the tang of the crème fraiche and a slight crunch from the grilled cheese. I really liked the Lobster Bisque. I also ordered the evening’s special for my entrée, Swordfish medallions with fried sweet potato gnocchi plus slices of cucumber and mango. I was a little hesitant ordering swordfish and mentioned my anxiety to the server about dried out fish. She was very confident about the chef’s ability. She was absolutely correct. The swordfish was perfectly prepared, moist on the interior and the texture indicated its ultimate freshness. The gnocchi added just a little crunchiness but it was not a significant flavor component. The mound of thinly sliced and slightly pickled cucumbers were a great addition. The entire dish was elevated by the sweetness of the ultra-thin slices of mango. This modest addition created a beautifully wonderful composition. The table ordered almost all of the desserts to share. My favorite was the Chocolate Molten Cake, which ranks as one of the top five I have ever eaten. The other outstanding choice was the White Chocolate Panna Cotta, which was served with sweet berries; the combination was outstanding. The Creme Brulee was slightly undercooked, a little runny, but the flavors were perfect and the topping was minimal, which is my preference. The last dessert was the Apple Pie. It was also delicious with crispy apples complemented by a crust with great buttery flavor. Overall, our venture to Oceana was nearly flawless and I cannot wait to return next year for another creative meal. The original plan was to meet at Donovan’s to watch the first half of the Cowboys-Packers game, have a burger, and I was looking forward to also ordering a bowl of Clam Chowder. But Donovan’s was packed so plan B was to walk down to Johnny Utah’s, which has a good beer selection for my buddies and 10 TVs for the game. While Donovan’s was packed, there was hardly a soul in Utah’s, so grabbing a table was an easy adventure. We immediately ordered Wings ($12.00), hot with bleu cheese. When they arrived they looked a little strange, instead on the wing slathered in sauce, they had a light coating and they were swimming in a small pool of Buffalo sauce, with a side of blue cheese dressing. I chose a winglet for the initial bite and it was OK. There was very little spiciness to the wing. I added a little extra sauce and again, they were OK, still not a lot of spice. I added extra sauce and a little blue cheese dressing and they were still, just OK, nothing special at all. They were pretty boring at best. With my bacon and cheese additions this was a $14.50 burger that was not worth the money. The next round was burgers. I ordered a medium-rare Johnny Utah’s Burger ($12.00), a half-pound burger with red onions, lettuce, and tomato, served on a brioche roll, and I added bacon and American cheese with a side sweet potato fries. For a bar that was 85% empty it took almost 25 minutes for 3 burgers and a sandwich, but we were watching the game so this was not an issue. When they arrived the consensus was that each was cooked more than ordered, mine was medium+. The first bite of the sweet potato fries was disappointing, they were all crust, tasteless and overcooked as well. The meat had a little flavor, was highly compressed, and offered little juiciness. The bacon was very pedestrian and the cheese was grocery store quality. The brioche had zero buttery goodness, it was very bland. Overall it was a very disappointing burger. 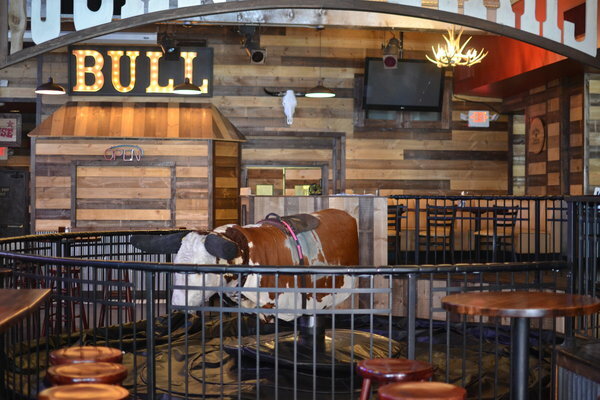 The service was outstanding, the server was prompt, efficient and checked in regularly. Hopefully this is the standard when she is serving more than one table. It was too bad that Donovan’s was too busy, and it is understandable why Johnny Utah’s was not.